Procured from the trustworthy manufacturers, our Aluminium Alloy Plates are the primary choice made by the buyers. 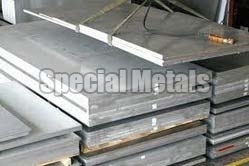 We are a dependable Exporter, Importer and Supplier of Aluminium Alloy Plates from Maharashtra, India. We are actively engaged in offering the Alloy Plates of grades such as 2024, 2014, 5083, 6061, 6063, 7075 in different tempers. They are offered by us in ample of thickness and sizes. Rely on us and place the order!